Coming Alive to Authentic Faith, Radical Freedom, and the Compelling Love of God! 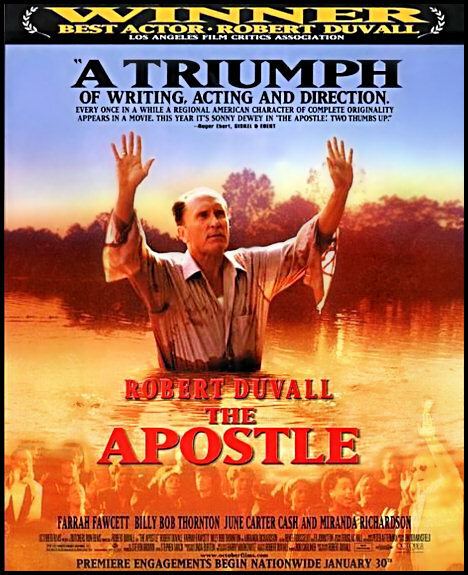 There are many reasons I believe Robert Duvall’s 1997 film, The Apostle, is a must see. Duvall’s portrayal is one of the best performances of his career and considering he is one of the best actors of his generation that is no small task. However, Duvall’s acting is not THE reason this film is so powerful. Second, the movie is notably one of the only films to come out of Hollywood with a realistic portrayal of “Bible Belt Christianity” (albeit a particular flavor). You find no cruel Scripture spouting warden as is portrayed in Shawshank Redemption, no apocalyptic fanatic as is displayed in Contact, there is no warped “Christian” psycho-path as in Cape Fear, and there is not even a faith healing con-man as seen in Leap of Faith. This film genuinely attempts to give an honest glimpse at a true believer, warts and all. Most evangelicals are not accustomed to receiving that level of respect by Hollywood and this is reason enough to watch this film but it is not THE reason. There are multiple reasons one should see the film but what is THE reason you should watch this movie? Well, The Apostle deserves to be taken seriously because the conflict between sin and grace lies at the heart of the plot and its portrayal of undeserved grace is both powerfully moving and disturbing. The plot is a modern day parable about sin and grace told through the story of a southern Pentecostal preacher. The first biblical reference invokes the story of the thief on the cross next to Christ who asks for and receives grace from our suffering servant Lord. The reference foreshadows the story of Eulis “Sonny” Dewey. Like the thief, Sonny is a deeply fallen sinner who desires salvation and longs for grace. Sonny is a true believer, a fact which is powerfully revealed in the first minutes of the movie when he and his mother, played by the late June Carter Cash, encounter a roadside accident. Sonny leaves the car and finds the injured, prays with them to receive Christ before returning to his car to tell his mother that news was “made in heaven today”. Religious charlatans do not take time to pray with the dying unless they smell a buck in it. However, though Sonny is a true believer, he is also a deeply flawed sinful believer. The film alludes to infidelity and abuse towards his wife and, when she leaves him for the youth minister of his church, Sonny kills the young man at a ball field in a fit of rage. When the film was initially released it was not received warmly by many evangelical Christians. I believe many simply could not deal with Sonny’s flawed character and that speaks more to our inability to fully understand God’s grace than the films portrayal of it. There is no doubt that this man is a sinner. That is the point being made. His actions are disturbing, even horrendous, but never unforgivable. One cannot deny that Sonny is a true believer. He is painfully aware of his humanity yet dedicated to God. He seeks redemption for his sin through prayer and fasting and symbolizes his new start with a baptism in a roadside river. Following the baptism we view a journey of redemption. Sonny begins again and brings Christ to others in genuine ways through word and deed. “The emergence of new life is neither sudden, dramatic, nor sensational. It comes in slow, incremental gestures. By the end, something profound, loving and final has taken over Sonny; he knows it and we know it too.”1 Sonny eventually is arrested and faces justice, in this life, for his actions but viewers have a sense that he really does not mind because he has found grace from God’s justice. In the end Sonny comes home and finds grace there and that is THE reason people need to see this film. 1. The quote is taken from Books and Culture (published by Christianity Today, 1997). This work by Darian Burns is licensed under a Creative Commons Attribution-Noncommercial-No Derivative Works 3.0 United States License.